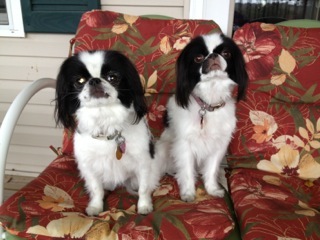 Animal Friends: Animal Friends' Home-To-Home Adoption Program Presents....Tani and Sashi! Animal Friends' Home-To-Home Adoption Program Presents....Tani and Sashi! Tani and Sashi are Japanese Chins. I need to find a good and loving home for them due to an unexpected change in my life situation. Tani just turned 8 years old, and Sashi just turned 9. I have had them since they were puppies. They are very friendly and make wonderful companions! Both like to play, but they don't need constant attention. Sashi rarely barks, and Tani attempts to howl when she hears a siren. They are just under 10 pounds and in excellent health. They are up to date on all shots and were spayed as puppies. I have complete and current vet records. I would prefer to keep them together, but will consider adopting out separately under the right circumstances. It is important to me that Tani and Sashi go to someone who really likes dogs, knows how to care for them, has the financial resources to provide for their care and grooming, preferably has a fenced yard for them, and will love them as much as I have.